Time of Flight Diffraction : Plant equipment in the process, power and refining industries undergo exposure to conditions that may result in degradation, corrosion, or failure. In today’s competitive climate, the operators of these plants come under increasing pressure to improve equipment reliability, while reducing overall costs. Conventional approaches to plant maintenance take the form of ‘time based’, preventative models, or indeed ‘reactive’ ones (i.e., failure before remedial action is carried out). Currently, there is significant focus on Risk Based Inspection (RBI) and Reliability Centred Maintenance (RCM), showing high promise for improving the overall performance of plant and cost controls. Both RBI and RCM require extensive use of non destructive examination and inspection technologies. However, the performance of the inspection technologies requires that several factors be considered. Are the speed and coverage of the examination adequate for the particular component, and are the sensitivity and the reliability of the technique being used suitable for the suspect damage mechanism or degradation. Time of Flight Diffraction (TOFD) is an ultrasonic technique that offers the most efficient and cost effective inspection tool yet developed for the non-intrusive examination of plant equipment. 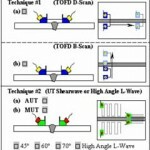 TOFD technique sees everything between the pulser (or outside surface, the inside surface, and the receiver – outside surface, again), and displays all flaws and data in a proportional sense. Therefore, TOFD is a very effective detection tool, providing excellent information on the nature and location of the inherent flaws. 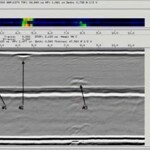 This provides plant management with a superior monitoring tool for reliability decisions. As detection and sizing are carried out in the same scan, this has the added benefit of allowing instant determination of the acceptability of flaws. Sizing using TOFD is carried out using direct measurements, not equivalent responses. Accuracy has been reliably demonstrated at +-1mm (0.040”) or better, both in sizing of length and through-wall height. 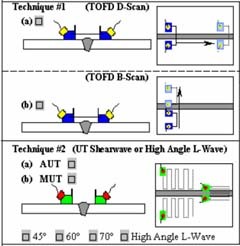 Because of the tandem setup of the TOFD probes, and by nature of the broad divergent beam employed, TOFD can examine the full volume of weld metal, heat affected zones and the adjacent base material in a single scan. This has been demonstrated to be much faster than radiography or manual ultrasonics. Scanning rates of two to six inches per second have been achieved in various field applications. It should also be noted that, as the material under examination gets thicker, there is no corresponding increase in the relative scan time. Another consideration is that the effect of mismatched or complex geometries has no real effect on either the performance of the technique or the scan time required. Can be applied to new construction welds, in lieu of radiography (ASME Code Case 2235), providing an excellent record of vessel or pipe condition at birth. Can also be used for in-service defects, such as cracking, corrosion, erosion, etc. Has a very high temperature limitation (700 F), with slight loss in sensitivity. Detects flaws regardless of their orientation within the weld. Can be applied without the need to shut down other activities in the area (which RT demands). Can be applied either during welding or immediately after completion of the weld, allowing instant determination of weld quality. Allows flaw growth monitoring for run/repair decisions. Weld examination of pressure vessels, piping and storage tanks and spheres. Hydrogen damage detection and sizing. Pre-service examination on new construction welds (cost savings by replacing RT). Weld examination during new construction (replacing RT). Detection and sizing of IGSCC. 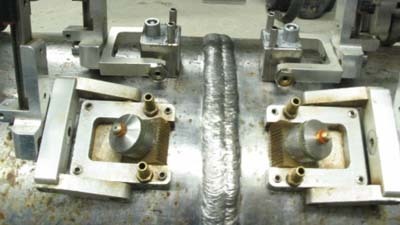 Complex geometry (nozzle welds, multi-layer vessels, TKY examinations). Flaw growth monitoring (allows equipment to remain in service and avoids unnecessary repairs). 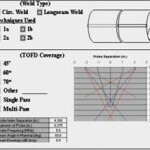 In-situ examinations of RTJ flanges (flanges remain bolted, resulting in cost savings). External discrimination of defects between weld overlay, clad and base metal (avoids unnecessary repairs). 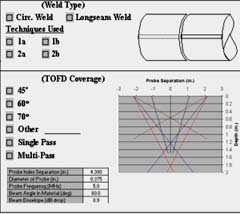 Examination of weld cavities and partially completed welds (in-process examination) resulting in higher weld quality and reduced rejections rates). External pressure vessel examinations (eliminating required internal inspection and cleaning and/or scaffolding). On-line exams of pressure vessels and piping, prior to turnaround (resulting in effective condition assessment and improved maintenance planning). Weld exams of HF Modified cast materials. Turbine rotor and disc exams. Until recently, the perception prevailed that automated ultrasonics and TOFD in particular, is prohibitively expensive. This was true when TOFD was being used solely as a sizing tool in the 1980’s. 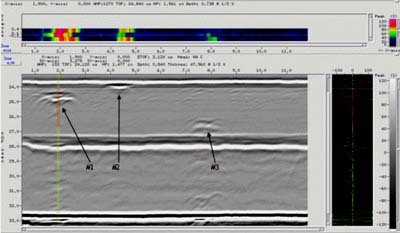 With the advent of smaller, less expensive imaging systems, combined with the expanded use of the TOFD technique, day rate charge has been reduced considerably. However, when considering the cost of TOFD, as with any comprehensive examination, one should not focus solely on the day rate fee. Other, more subtle total costs need to be considered. The production rates on TOFD are extremely high – many times that of radiography or manual ultrasonics. The inspection can be accomplished on-line with no loss of plant production, resulting in major savings. If defects are noted, they can be accurately monitored, again allowing for more effective asset management decisions. The ability to conduct the examination in the midst of a busy shut down, without the traditional clearing of an area to perform radiography, provides massive savings in man-hour costs. Consequently, in applying TOFD, the total costs versus the hourly costs need to be considered before assessing the technique as expensive. It is more flexible and has more applications than standard ultrasonic techniques. Specific proposals and alternative applications are available upon request.